Preemie, (newborn, 0-3 months [3-6 months, 6-9 months, 9-12 months] [12-18 months, 18-24 months]) to fit a 14 (15, 16 [17, 17.5, 18] [19, 20])”/ 35.5 (38, 40.5 [43, 44.5, 45.5] [48, 51]) cm chest measurement. 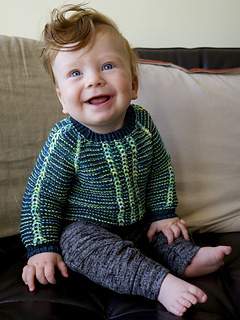 A chance to pair some fun yarns, this raglan sweater pattern is designed to make the most of one solid or semi-solid yarn, and one contrasting speckled, variegated, or gradient skein. Slipped stitches mark out faux raglan and side seams, while a slipped cable pattern running down the front and sleeves keeps things interesting (for the knitter, too!). 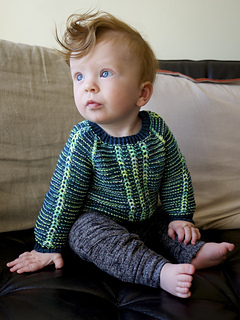 There is a classic cable crew neck, and snug cuffs to prevent the sweater slipping down over tiny baby hands. Worked top down, it is easy to customize the sleeve and body length to the recipient. Preemie, (newborn, 0-3 months 3-6 months, 6-9 months, 9-12 months) to fit a 14 (15, 16 17, 17.5, 18)”/ 35.5 (38, 40.5 43, 44.5, 45.5) cm chest measurement. 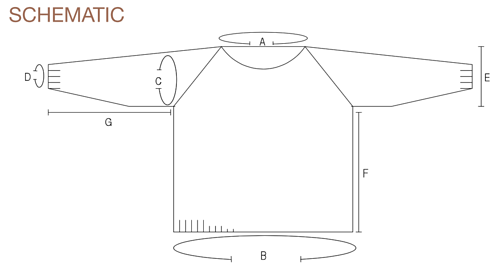 Sweater is designed to be worn with approximately 1 inch/ 2.5 cm of positive ease. This pattern is written. A chart and written instructions are provided for the slipped cable pattern. Intermediate. The pattern involves a provisional cast on, slipped stitches, twisted stitches (2-stitch cables), and picking up stitches for the neckband.